This is the way we have been taught to understand our attractions: You’re either attracted to someone right now, or you won’t ever be. For example, Ann was attracted to guys who were somewhat arrogant, but she didn’t appreciate being treated disrespectfully by anyone—least of all by her boyfriend! Still, cocky guys turned her on in a visceral way, and nice guys just didn’t. She really wanted a husband and family, but the people she was attracted to weren’t marriage material, and the ones who were marriage material didn’t excite her. If you relate to Ann’s predicament, you certainly are not alone. All of us are attracted to certain types that can knock us off balance: a physical type, an emotional type, and a personality type. With some attractions of deprivation, we see the red flags early on but can’t stop ourselves. With others, the upsetting aspects of the relationship don’t reveal themselves right away. Soon enough, however, these less-than-positive qualities become obvious, whether your partner is lying, cheating, unavailable to you in times of need, overly critical, selfish or—in the worst cases—addicted to substances or in the grip of a psychological disorder. In these systems, you get rewarded only sporadically and you can’t control when the reward will come. Intermittent reward systems are some of the most compelling forms of reinforcement and among the hardest to break free of. Gambling is a perfect example. Attractions of deprivation are also among the trickiest ways to flee real intimacy. In these relationships, our fear of intimacy is hiding in plain sight. We’re desperately seeking a solid love—from someone who we know, deep down, won’t give it to us. With an attraction of deprivation, in some odd way, we are safe. I’ve found that the people most drawn to attractions of deprivation experience discomfort, fear, unworthiness or anger when they are confronted with a kind, stable and available partner. The more we are drawn to attractions of deprivation, the less we will feel comfortable with available and caring people. Attractions of deprivation are frequently birthed by our fear of our own power and, oftentimes, our fear of love. At bottom, they are distractions from the scariest things of all: the challenge of our gifts in our lives. 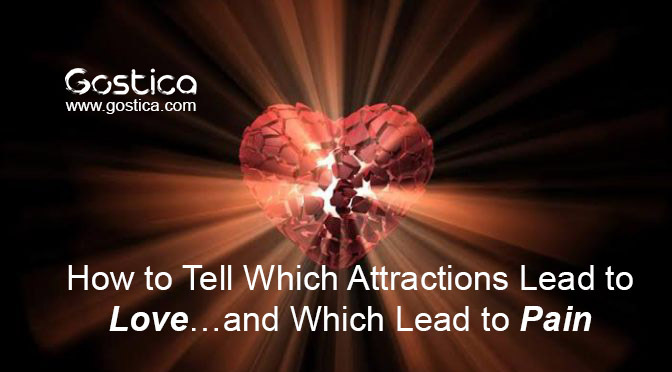 The great secret to lasting lovelies in learning the difference between your “attractions of deprivation” and your “attractions of inspiration.” Then only follow your attractions of inspiration. This method sounds so simple, yet it takes decades for most of us to arrive at this truth if we ever do at all. Recognizing attractions of inspiration takes time, patience—and attention. In these relationships, our challenge is to accept and return our partner’s caring, not to win that caring. Attractions of inspiration are fueled by the real sense of well-being that the relationship creates in us, not by the unrelenting itch for something that’s denied us. These attractions often unfold slowly. They get richer as time goes on. Here are some markers for identifying your attractions of inspiration: Are you inspired by your partner’s (mostly) consistent caring and acceptance? Are you inspired by your partner’s goodness, decency, and integrity? Is your love fueled by respect for the kind of person your partner is? Are you and your partner willing to do the hard work of healing the relationship’s areas of weakness? Do you like who you are in the presence of your partner? Does he or she make you a better you? Relationships of inspiration are not just for the lucky. We all can find these relationships by dating in wiser ways. The first step on this path is to look for inspiration at least as much as we look for sexual attraction. These relationships are not only the path to love; they are the path to our own greatness. Through them, we can find a way past the fears and wounds that dwarf us. We experience our partner seeing into our very core—and valuing what is there. With this comes a sense of bravery, an innate desire to share our gifts—not out of obligation but from a sense of joyful overflow. And that makes us into just the kind of person we are looking for—one who inspires others simply by who he or she is.